When constructing or renovating a house, choosing the right windows is one of the most important decisions you are faced with. This is because they have such an impact on both the outside appearance of your home and the interior look. As a first step, let’s guide you through the options of the window frame material that is right for you. The frames most commonly used in Australia are either made out of powder coated aluminium or timber. Which way to go depends on the style you wish to achieve. If you love the Hamptons look, you can’t go pass timber windows. They can look spectacular in the right environment, but be aware that they require regular maintenance such as painting. A big plus is their energy efficiency thanks to the natural insulating properties of timber. If a contemporary, minimalist style is yours, opt for the sleek frames of aluminium windows. They are gentle on your wallet and practically maintenance free. In the event that you’re unsure what your personal design style actually is, find some tips here . Once you have decided on the material, there are 6 basic window types to choose from, each with a lot going for them but also with some downsides. If you want an easy to operate window with a simple and classic design, you can’t go wrong with a sliding window. They are still very popular nowadays. Side hung windows, also called casements, have a timeless appeal to them while offering excellent ventilation. Hinged at the top and open out to varying degrees, top hung awning window have a clean look, but usually provide poor ventilation. Double hung windows slide vertically up and down and both panels can move independently or just one can move and the other is fixed. Keep in mind that double hung windows only allow half the window space to be open at one time so they only provide average ventilation. But don’t they look stunning in a renovated period house. Bifold windows are made in two or more panels that fold back like a concertina and stack at one end or both ends of the window frame. They allow the window to be completely open for the inside space to connect with the outdoors. 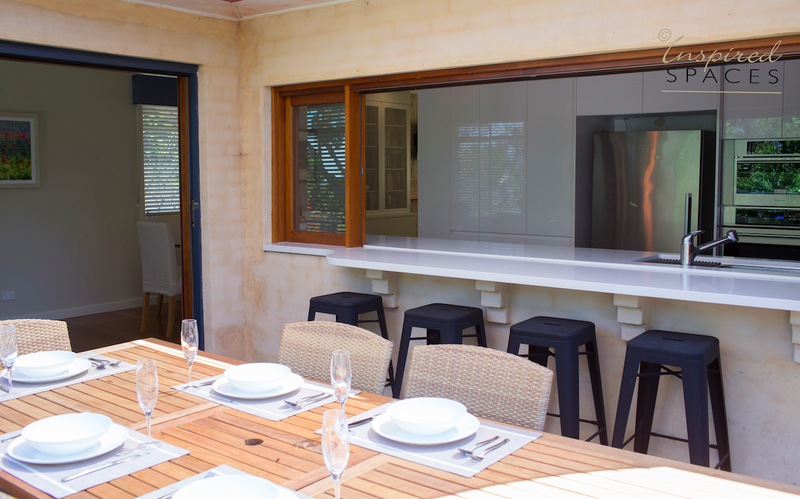 They are great for long wide windows that have dramatic outlooks and can be used as a servery onto your deck area. Here are some additional tips on indoor-outdoor living and on how to boost your outdoors. Louvre windows consist of blades made out of glass, aluminium or timber and are great for ventilation. They can be left open at an angle in light rain without an overhang being required. The downside is that they are a nightmare to clean. More challenging than deciding on the type of window is to determine the optimum position of your windows as they affect both the exterior and the interior. With a big impart on the curb appeal of your house, you might wish to put a lot of thinking into the windows facing the front. On the inside, the clever placement of the windows make your rooms feel balanced. It also decides on how successful you can furnish the space and hence determines its functionality. Frame and enhance your windows with the perfect window treatment to round up your stunning interior styling. If you have questions or need some advice on the right window selection, please contact the Inspired Spaces team.